In 2012 we published a diagram that gave a view of the evolutionary process behind the development of MOOCs in our white paper (MOOCs and Open Education: Implications for Higher Education, p.6). Recently we revisited this diagram (I know you shouldn’t try to re-heat a Soufflée!) in a paper (Partnership Model for Entrepreneurial Innovation in Open Online Learning) where we made an analysis of what, if any, impact MOOCs have had over the past 3 years and what the trajectory of development might be in the future. I. Most MOOC content is not openly licensed so it cannot be reused in different contexts. However, there is a trend for MOOC to be made available ‘on demand’ after the course has finished, where they in effect become another source of online content that is openly available for use to support blended learning courses or a flipped classroom approach in face-to-face teaching. New pedagogical experiments in online distance learning can be identified although It is likely that they will evolve to more closely resemble regular online courses with flexible learning pathways. However, a range of paid-for services, including learning support on demand, qualitative feedback on assignments, and certification and credits will develop. The disruptive effect of MOOCs will be felt most significantly in the development of new forms of provision that go beyond the traditional HE market such as professional and corporate training that appeals to employers. these will be backed by awards from recognised institutions. The development of online courses is an evolving model with the market re-working itself to offer a broader range of solutions to deliver services at a range of price levels to a range of student types. There is great potential for add-on content services and the creation of new revenue models through building partnerships with institutions and other educational service providers. As these trends continue to unfold, we can expect to see even more entrepreneurial innovation and change in the online learning landscape. This entry was posted in Learning thoughts on June 13, 2015 by Stephen Powell. 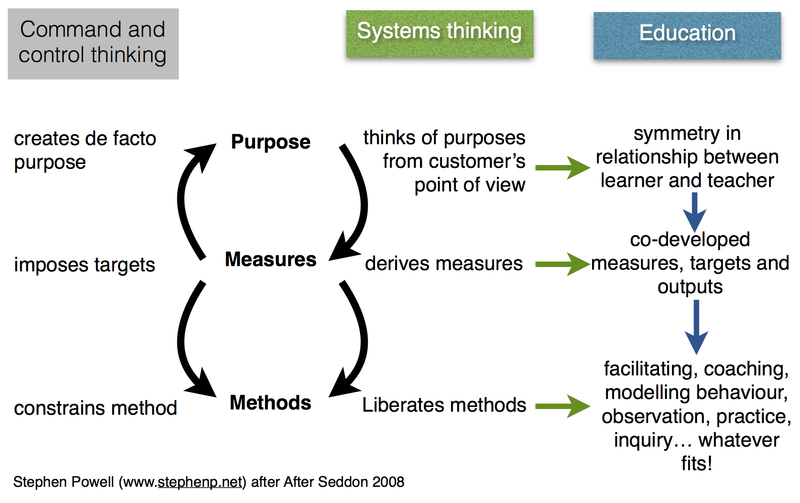 John Seddon is a UK based systems thinker working primarily in the public sector. One of his core arguments is that when targets are imposed (a command and control managerial approach) on a system , it results in de facto purposes being created which, in turn, constrains the methods being used to undertake the work at hand (Seddon 2008, 82) – this is critique of Michael Barber’s Deliverology. I think that there is a lot in this simple analysis for educators when trying to innovate teaching in educational institutions. One example of this in a higher education context is the use of learning outcomes for management and to make uniform the way in which curriculum are described, offering the prospect of a common student experience and a way of standardising evaluative judgements about achievement. This has lead to a way of authoring course/module specifications that severely restrict what and how students are assessed. Successfully meeting learning outcomes (coupled with assessment criteria) has become the de facto purpose of the educational system. As a consequence, educational methods (teaching practices) are severely constrained so that the purpose is met; learners and teachers work tirelessly towards successfully completing the assessments for a course. Working this way severely distorts the students education in a direction imposed from the outside by what are often poorly constructed requirements in the first place. Little attention is payed to the needs of the students and there is limited scope for teachers to innovate in their practice as the risks are too high of students failing to meet the targets. It doesn’t have to be like this. I would argue for putting the target setting back in the hands of the teachers and learners to identify their local needs (their purpose) and set their own targets thereby enabling teaching methods to be liberated. This doesn’t have to be a free-for-all approach, but a redressing of the balance back towards the professionalism of the teacher and sharing responsibility for learning with the student will I think improve the outcomes. In practical terms, there is a place for well crafted learning outcomes that focus on the capabilities we are seeking to develop in learners but that allow for significant negotiation of how to achieve and demonstrate this. This entry was posted in Learning thoughts on July 23, 2014 by Stephen Powell. Beyond MOOCs: Sustainable Online Learning in Institutions. Below is the executive summary from our Cetis paper Beyond MOOCs: Sustainable Online Learning in Institutions, looking at the benefits that institutions might gain from the recent MOOC mania. I think the section on business models has the most to offer to institutions, but this was also the hardest part to explain in a way that would be helpful to Institutions. The key opportunity for institutions is to take the concepts developed by the MOOC experiment to date and use them to improve the quality of their face-to-face and online provision, and to open up access to higher education. Most importantly, the understanding gained should be used to inform diversification strategies including the development of new business models and pedagogic approaches that take full advantage of digital technologies. The critical discourse emerging around MOOCs is providing an opportunity for institutions to develop a more strategic approach to online learning. This includes enhancing existing classroom teaching practices, promoting institutional reputation and developing new revenue models. There are indications that some MOOCs are becoming more focussed on corporate training, which suggests that they may not pose a immediate threat to the existing pedagogical, revenue or business models of higher education institutions (HEIs). The number of Massive Open Online Courses (MOOCs) will continue to grow with the development of credit bearing courses likely to be a trend. The findings from this report are summarised in three sections: key themes that have emerged from the MOOC experiment, opportunities that institutions should consider exploring, and longer-term strategic considerations and likelihood that this will happen for institutions. This entry was posted in Learning thoughts on January 21, 2014 by Stephen Powell. The above titled presentation was given at the recent altc2013 conference in Nottingham. It was based on work undertaken by the jisc cetis service in the production of the Cetis Analytics Series in 2012/13. In addition, towards the end of the 2012-13 academic year we undertook a Survey of the State of Analytics in UK Higher and Further Education Institutions 2013. This entry was posted in Learning thoughts on September 16, 2013 by Stephen Powell. Below is the executive summary of this Cetis publication I wrote with Dr Li Yuan. Our best effort at summaring the phenomena that is MOOCs. This report sets out to help decision makers in higher education institutions gain a better understanding of the phenomenon of Massive Online Open Courses (MOOCs) and trends towards greater openness in higher education and to think about the implications for their institutions. The phenomena of MOOCs are described, placing them in the wider context of open education, online learning and the changes that are currently taking place in higher education at a time of globalisation of education and constrained budgets. The report is written from a UK higher education perspective, but is largely informed by the developments in MOOCs from the USA and Canada. A literature review was undertaken focussing on the extensive reporting of MOOCs through blogs, press releases as well as openly available reports. This identified current debates about new course provision, the impact of changes in funding and the implications for greater openness in higher education. The theory of disruptive innovation is used to help form the questions of policy and strategy that higher education institutions need to address. MOOCs are a relatively recent online learning phenomenon, having developed from the first early examples five years ago, they are now generating considerable media attention and significant interest from higher education institutions and venture capitalists that see a business opportunity to be exploited. They can be seen as an extension of existing online learning approaches, in terms of open access to courses and scalability, they also offer an opportunity to think afresh about new business models that include elements of open education. This includes the ability to disaggregate teaching from assessment and accreditation for differential pricing and pursuit of marketing activities. The opportunity that MOOCs offer for massification of courses has generated significant interest from governments, institutions and commercial organisations. A number of bespoke MOOC platforms have been developed and offer courses independent of or in collaboration with universities. A growing number of institutions have been involved in engaging and experimenting with MOOCs for the purpose of expanding access, marketing and branding, as well as the potential of developing new revenue streams. Motivations for learners to participate in MOOCs are varied, and many struggle to engage with courses and keep motivated in the context of an online learning environment. The market value of certification of courses, short of credit as part of traditional institutional awards, has yet to be determined. Other potential business models are being developed but need further work to establish them. Over recent years there has been a significant change in societal adoption of Internet technologies with extensive proliferation and use in more economically developed countries. However, in terms of the proliferation of MOOCs as an educational approach, there is a risk that the current enthusiasm is being driven by a self selecting group of highly educated, IT literate individuals who are able to navigate the sometimes complex, confusing and intimidating nature of online learning. In general, there are concerns about the pedagogy and quality of current MOOC courses, with a clear distinction between process and content-based approaches. The motivation for some MOOCs is a philanthropic one and for others a business proposition. However, in both cases, there is the challenge of finding a viable model that allows for sustainability of MOOC provision. The theory of disruptive innovation (Bower and Christensen, 1995) offers an explanation as to why some innovations disrupt existing markets at the expense of incumbent players. In this case, there is a significant question for higher education institutions to address: are online teaching innovations, such as MOOCs, heralding a change in the business landscape that poses a threat to their existing models of provision of degree courses? This possibility is brought about through the combination of wider societal adoption of communication and, particularly, Internet technologies, changing funding models and the development of new business models that leverage this opportunity. If this is the case, then the theory of disruptive innovation suggests that there is a strong argument for establishing an autonomous business unit in order to make an appropriate response to these potentially disruptive innovations. The current UK political administration has continued the course set by the government with an even more radical agenda to allow new, for-profit providers to enter the higher education market. These include, changes to funding whereby students pay most of their tuition fees, through student loans, and changes to national quality assurance measures so that new players can enter the market place and offer new, differentiated provision including more for-profit universities. There is also an opportunity here for open education where less traditional lecturing and more facilitative and guided approaches to education can find a place in this new landscape of online learning where increased fees for established models may act as a deterrent to students. This entry was posted in Learning thoughts on March 14, 2013 by Stephen Powell. 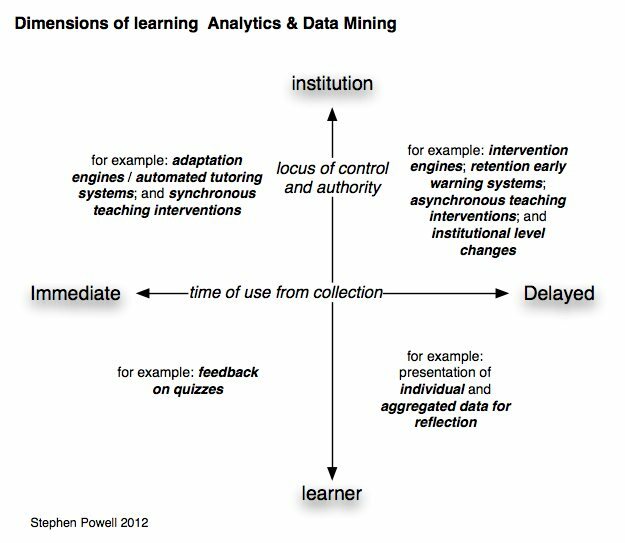 I found the “Enhancing Teaching and Learning Through Educational Data Mining and Learning Analytics” (Draft report US Department of Education, 2012) publication an interesting explanation and introduction to ‘educational data mining’ and ‘learning analytics’. My simple interpretation, is that Data Mining advocates seek to automate learning through extensive analysis of previous learners behaviours captured in learning systems. Whereas advocates of Learning analytics emphasise not prediction but on providing information (often visual) to inform stakeholders for decision-making purposes. 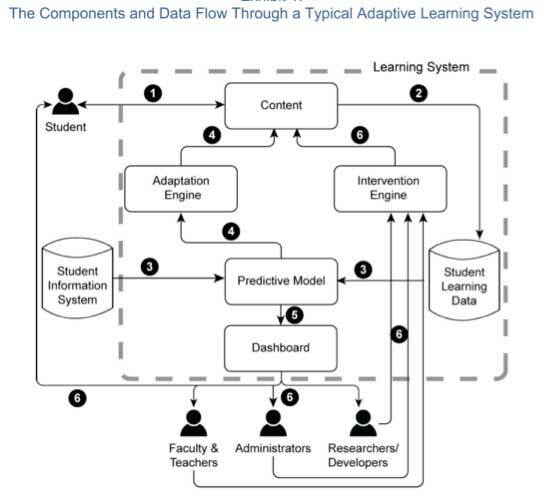 This report seeks to combine these two traditions in the concept of an ‘adaptive learning system’, the model below being self explanatory and at first glance convincing, but I think too tidy in practical terms. 1. the limited view of learning as shown by the exposure of a ‘Student’ to ‘Content’ as generating ‘student learning data’ – learning as process? 3. and the fact that online courses seem to be the focus – there are lots of data to be analysed on f2f courses. I think that the letter point is a more general observation of work on learning analytics. As someone new to this domain of knowledge, two organisations appear to represent the different traditions, see the Society for Educational Data Mining and the Society for Learning Analytics Research – SoLAR. In a previous post, I conflated both of these under the Analytics badge, but now see more clearly a difference. This entry was posted in Learning thoughts on April 15, 2012 by Stephen Powell.